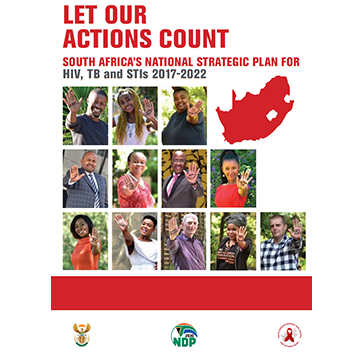 The National Strategic Plan (NSP) 2017 – 2022 serves as a roadmap for the next stage of our journey towards a future where HIV, TB and STIs are no longer public health problems. This plan sets out the destinations – or goals- of our shared journey and establishes landmarks in the form of specific measurable objectives. Intensifying the focus on geographic areas and populations most severely affected by the epidemics. Strengthening systems and initiating processes to provide the foundation necessary for higher performance. A strong focus of this NSP is improving the prevention of HIV infection among among adolescent girls and young women because of the extremely high rate of infection in this section of the population. Not only does early infection irreversibly shape the lives of hundreds of thousands of women from their teens and early twenties onward, but reaching our national targets for reducing HIV is unthinkable without putting young women first. Five-year NSPs for HIV, TB and STIs are an established tool for directing and coordinating our national effort and ensuring our interventions are relevant, based on evidence and guided by methods that have been shown to be effective. However, this particular NSP comes at a critical stage in our protracted effort to overcome HIV, TB and STIs. GOAL 1: Accelerate prevention to reduce new HIV and TB infections and STIs. GOAL 2: Reduce morbidity and mortality by providing HIV, TB and STI treatment, care and adherence support for all. GOAL 3: Reach all key and vulnerable populations with customised and targeted interventions. GOAL 4: Address the social and structural drivers of HIV, TB and STIs, and link these efforts to the National Development Plan (NDP). GOAL 5: Ground the response to HIV, TB and STIs in human rights principles and approaches. GOAL 6: Promote leadership and shared accountability for a sustainable response to HIV, TB and STIs. GOAL 7: Mobilise resources to support the achievement of NSP goals and ensure a sustainable response. GOAL 8: Strengthen strategic information to drive progress towards achievement of the NSP goals. Animated Video: What is the NSP?